Το 1715 House & Caff Resort είναι μια πολύ καλή επιλογή για τη διαμονή σας σε Πουκέτ, είτε είστε τουρίστας είτε επαγγελματίας. Το ξενοδοχείο δεν απέχει πολύ από το κέντρο της πόλης: μόλις 15 KM, και συνήθως χρειάζεται περίπου 60 λεπτά για να φτάσετε στο αεροδρόμιο. Με την βολική του τοποθεσία, το ξενοδοχείο προσφέρει εύκολη πρόσβαση στους προορισμούς της πόλης που πρέπει οπωσδήποτε να δείτε. Οι εγκαταστάσεις και οι υπηρεσίες που παρέχει το 1715 House & Caff Resort διασφαλίζουν την ευχάριστη διαμονή των πελατών. Οι πελάτες του ξενοδοχείου μπορούν να απολαύσουν υπέροχες δραστηριότητες όπως τα δωρεάν WiFi σε όλα τα δωμάτια, ημερήσιος καθαρισμός, υπηρεσία ταξί, προσβάσιμο με αναπηρικό καροτσάκι, εγκαταστάσεις για άτομα με αναπηρία. Η ατμόσφαιρα του 1715 House & Caff Resort αντανακλάται σε κάθε δωμάτιο. Στην ιδιοκτησία θα βρείτε επίπεδη τηλεόραση, κρεμάστρα ρούχων, δωρεάν καφές φίλτρου, δωρεάν ποτό καλωσορίσματος, λευκά είδη, καθώς και πολλά άλλα. Το ξενοδοχείο προσφέρει μερικές μοναδικές ευκαιρίες ψυχαγώγησης όπως οι σάουνα, εξωτερική πισίνα, καραόκε. Απολαύστε τις ασύγκριτες υπηρεσίες και μια πραγματικά περίβλεπτη διεύθυνση στο 1715 House & Caff Resort. Only cats or dogs weighing under 2 kilograms are allowed at the property. The staff are sooo friendly and helpful. They welcomed us with at the front gate at 11 pm. 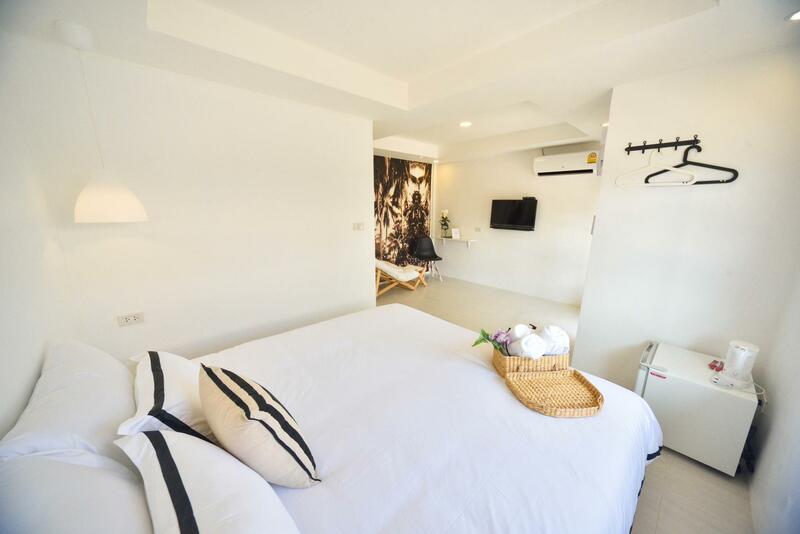 The studio is very comfortable for single travelers and couples. They have a small pool and sauna rooms. They offer pretty cheap breakfast, and you can even have barbecues. A lot of rules. Very basic rooms. Next to no really useable furniture. Breakfast is almost a joke. Staff is very honest and friendly. Some cute housecoats are roaming around on the premises. Pool is very small and definitely suited for children. Location right next two a 4way Main road. Parking cars/scooters is free and right next to to the "resort". Everything are clean neat, except for the shampoo hanger is rusty. Just located on the roadside to Rawai beach. There are motor for rent just beside the hotel. Rent one, and you will get yourself just 5mins to the nikitas restaurant, Rawai seafood market & mok dee restaurant. Staff was friendly and polite, they even give us one nicely box of their homemade dessert for us to celebrate new year! Found this place at last minute, very good price and clean. Staff can't speak english at all, linen was not properly cleaned (stains), shower broken, Shower gel metal bottle dirty. The hotel was not clean. We had a problem with some one's hair left on bed and period stain unable to wash out on sheet. We tries changing the room, but the reception was not incorporate. Very bad experience. Super affordable! Really loved it here. Had a late check in the first night, the staff ran towards the reception knowing that I was waiting. Such a sweet girl. Booked this acc quite last minute and probably the best decision ever. Location was a little far from the main streets but it was a decent walking distance. Decent clean room with basic amenities. Was prepared a welcome drink and a side fruits despite checking in late. Designed as such that it literally felt like I’m Alice in Wonderland. They have sauna facilities of which I didn’t had the time to give it a try. Will come back here again. Rawai is definitely the next up and coming. Great job guys! Thank you so much for your review especially the alice in wonderland part. We hope to welcome you again in future. Lovely little villas. Little tip - if you are booking for a while, the hotel offers month lets for 3,000 baht. The only concern I have is the amount of bugs and lizards that make there way into the room and the distance to any beach. I stayed here for a few days and every time the cleaning lady came to clean the room she would knock on the door and when I opened it she would push past me to look in the room even after I said I did not want cleaning today. She came back multiple times and would always try and look in the room. I felt I had no privacy. The facilities were average and in my opinion overpriced. I would recommend staying at another property. everything is perfect. nice and friendly staffs. friendly other guests. i will stay again if i visit rawai again. ·Advantage：Sweet layout, concise and Nordic style, very comfortable for vacation and relaxing. The market on Sunday is so close and amazing. There are many restaurants nearby. The franchisee so enthusiastic and mindful and speek very well English. ·Disadvantage：Few ants and roach in the room... The stuff don't speek English. There‘s no meals inside this hotel. Dear both, thank you so much for such a great review and for choosing our resort. It is good to read that you had a pleasant stay with us. Looking forward to welcoming you again in future. Thank you for staying at 1715 House & Caff Resort Phuket and your review. We hope to welcome you again in future. Value for money. Good, clean, white tone, high speed wifi actually works unlike many hotels around here. Additional breakfast was only 50B 😁Has pool, sauna, shared kitchen, everything I need. Really place for take a rest, clean, not to crowded and safe. Would be perfect if you could rent a motor bike. The rent price are really reasonable. Pros: really nice, clean villa studios which made it feel like your own for a few days as the complex was very peaceful and quiet unlike most hotels. It also had a pool and sauna and free breakfast. Not too far from the beach too which is always a plus! Cons: the continental breakfast could have done with a change as it was too many carbs on one plate (croissant, 2 bread rolls and 2 pieces of toast)- maybe they could take out a couple and have a small fruit salad instead. Although the staff were very friendly I think maybe they could improve their English a little more as it was very limited which isn't always great when you have a question. Overall a great place to stay and id definitely go back! Thank you so much for such a great review and for choosing our resort. Hope to welcome you again in future. You'll be surprised with a villa itself. Rooms were getting cleaned daily but when you hang " donot disterb sign on a door they still come to a room and clean it. Friendly staff and absolutly helpful. The highlight was a bbq facility. Breakfast was so so. There are lots of shops nearby. However location wasn't great, it was short taxi away from a beach. It was next to a main road and quit noisy. No safe for our passports. But overal well kept and stylish place if you can ignore a location.